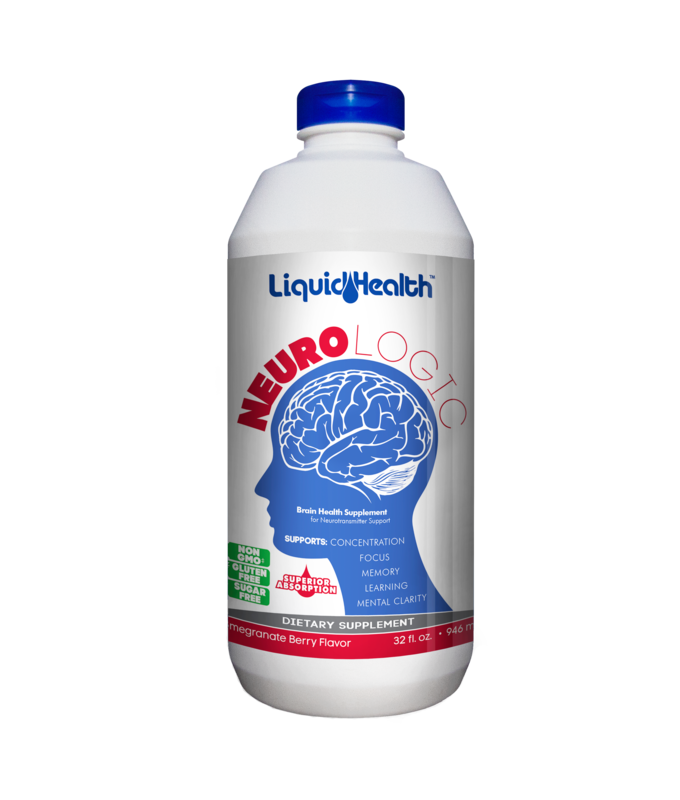 Liquid Health™ NEUROLOGIC provides the nutritional foundation for superior brain function. Proper nutrition can ensure your brain is operating at peak performance, despite factors such as stress, age, and fatigue. Regardless of age, gender, or profession, everyone depends on the brain. It allows us to learn new things, warns us of danger, helps us figure out solutions to problems. Unfortunately, cognitive function is susceptible to decline with age, and also in times of physical and mental stress. Proper nutrition can ensure your brain is operating at peak performance, despite these factors. Liquid Health™ NEUROLOGIC provides the nutritional foundation for superior brain function. Whether you are studying for finals, or just tired of forgetting where you put the keys, NEUROLOGIC can help. Liquid Health™ NeuroLogic is packed with brain health and memory-supporting nutrients, including Ginkgo Biloba, Huperzine-A, Alpha Lipoic Acid, and the carefully developed, high-quality memory supplements Alpha- glyceryl phosphoryl choline & SerinAid® PS (Phosphatidylserine, Phosphatidylcholine, Phosphatidylethanolamine, Phosphatidylinositol). Directions: Shake Well. Refrigerate after opening. May be mixed with juice for best taste. Settling is normal. Protect from heat, light, & moisture. As with any natural product, color and taste may vary. ** Daily Value Not EstablishedOther Ingredients- Purified water, aloe vera juice, erythritol, citric acid, natural flavoring, natural colors from fruit juice, xanthan gum, stevia leaf extract, potassium sorbate (to preserve freshness), potassium benzoate (to preserve freshness).ALL Liquid Health™, Inc. Products MADE IN THE U.S.A.AlphaSize® & SerinAid® are registered trademarks of Chemi Nutra. CONTAINS NO ARTIFICIAL COLORING OR FLAVORING, SUGAR, STARCH, SALT, WHEAT, GLUTEN, YEAST, OR MILK DERIVATIVES. *THESE STATEMENTS HAVE NOT BEEN EVALUATED BY THE FDA. THIS PRODUCT IS A DIETARY SUPPLEMENT AND IS NOT INTENDED TO DIAGNOSE, TREAT, CURE, OR PREVENT ANY DISEASE. Our premium blend of liquid vitamins is designed to provide children with the important vitamins and minerals that their bodies need on a daily basis. This is truly a remarkable multivitamin all packed into a delicious liquid vitamin formulation that is easy for kids to take.